Learn how to create and manage a pay-per-download file sales and delivery system. It is so important that you consider and understand the benefits of selling paid downloads online with the help of PayLoadz as a payment platform and gateway. Selling pay for download products creates a passive, automated income stream. Let us help you make more money selling your pay and download files easily, quickly, and most importantly, securely. As an online seller of digital goods, you know that this industry can be quite lucrative when you know what you’re doing! Almost any digital good sold online can be considered a pay and download product. This expansive list includes the likes of e-books, music files, movies, manuals, software, PDF files, teaching tools, stock photos, and just about anything else! In fact, many PayLoadz members also sell their digital art through our pay per download service. When it comes to selling pay to download files, through PayLoadz or any other venue, there are some pretty simple basics that you’ll need to have a grasp on. As long as you stick to the basics at first, you should see your pay to download sales increase exponentially. It all really comes down to giving your customers plenty of options when it comes to pay to download services, marketing, and customer service. Since you’re already in the online selling industry chances are you probably already have a website of some sort. However, if you are new to the idea of pay download products, the first thing you need to have is an online presence. While your own website or blog definitely helps, you can rest assured that we can help with your e-storefront. Firstly, if you already have a website, simply use our special code and links to your site to make your downloadable product sales even easier for your clientele. Without an existing site, take advantage of listing your pay per download items in the PayLoadz Store. First and foremost, never choose a marketing or advertising campaign just because it doesn’t cost a lot of money. That’s the biggest mistake made by online retailers. The key is to simply know your audience. Think about your pay to download products and then consider who might be paying to download those items – that’s your target. You don’t want to waste valuable time and money marketing to an audience that has no interest in your products. Take some time, do a little research, and then set your sights on the goal. It also helps to know highly relevant keywords and phrases associated with your digital goods. A pay per download workflow to your sales scheme definitely allows you a certain level of control when it comes to your product, profits, and protection. Many online retailers specializing in traditional products (tangible items) don’t have this level of control over resources. When you sell pay per download products you can set up different delivery and payment options thus reducing charge-backs and fraudulent purchases. 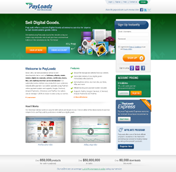 PayLoadz is a shopping cart, a delivery system, and secure payment gateway in a single solution. Our most common payment methods accepted include Google Checkout and PayPal, though there are also other options available to our members and their customers. With our system you can offer single pay per download items through simple links, email attachments, download pages via our site, or even with product key registration codes. You can also offer free samples, subscriptions, and limited-time offers. We know the key to success is making the download and purchase process as streamlined and simple as possible. When you use PayLoadz, the possibilities are endless! Make your product listings as clear and concise as possible. Use relevant keywords, images, and straightforward descriptions. Remember to take advantage of our Featured Listings tool when listing products in the PayLoadz Store! Allow the buyer to initiate the checkout process and always provide as many payment options as possible. Always provide speedy receipts and download instructions once payment is received and confirmed. If your downloadable products are password protected, send the information right away! Now that you know the basics of selling pay per download products let us remind you of some of the benefits of using our system. We offer cost-effective programs for our members that definitely help boost your sales while costing you nothing to sign up! Our automatic and instant delivery of your pay to download products is safe, reliable, and efficient – with all files hosted on our secure servers. With PayLoadz you can sell virtually any digital product, so what’s stopping you from getting started today? Since 2002, our service has been providing pay download system that works great for anyone from a small merchant to a large corporate solution.Let our turn-key system start deliverying your paid download files after purchase. Sign up today for a free PayLoadz account and sell your download instantly.